The Albany Trig Track is a stunning undulating walk through wonderful NZ native bush suitable for the whole family. 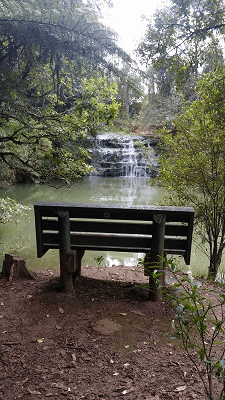 This great Auckland walk is located not far from the Albany Stadium on Auckland’s North Shore, it is easily accessible and easy to slip into your day! Great views are obtained from the area near the trig, but the exceptional part of this walk is the descent on the western section of the main track where the land falls away steeply. Here you will see many big trees including kauri and massive puriri. 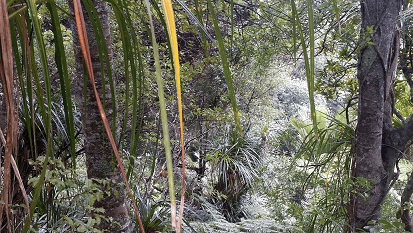 Spectacular views are obtained looking down on groves of nikau. Walking in an anticlockwise direction is recommended because the great beauty of the bush can be best appreciated by descending rather than climbing through this exquisite area. The walk to the Waterfall can be completed as a standalone walk of about 600m return or included as part of your loop. At the waterfall there is a park bench to sit and enjoy the view and sounds. Another 100m further is a picnic table in a lovely grassy area. The track can be accomplished by people of most abilities. It has some quite steep sections but nothing technical or overly dangerous. The track itself is in good order with a lovely metal base that makes it walkable all year around. There are two main entry points for this track. Walking along the driveway that starts immediately on the left after coming out of Albany and crossing the Gills Rd bridge. It then follows the wide grass track that climbs up the hill. The parking is far better at Carol Lee Place. Once parked, follow the grass area down for about 60m and turn left through the into the reserve where the track starts. Alternatively, you can start your walk by entering straight off the end of the carpark. 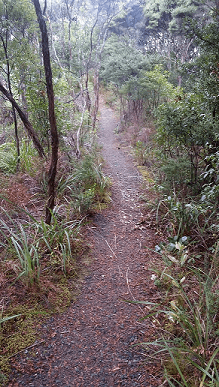 This way takes you towards the top section of the track, past the trig and down into the nikau grove area. This track is suitable for running and walking. The track is in great condition and would be a wonderful addition to any run in the area. The track is up and down, steep and flat and has great stability and footing. The 2km run would take 12 – 25 minutes depending on the ability of the runner. The waterfall track is fine for wheelchairs and buggies. The remainder of the track is not suitable, being too steep, narrow in places and too many stairs. This is a wonderful track that is ideal for people who desire a walk up to about an hour (with stops) in some beautiful bush with great views. It is well worth a visit to get yourself, your friends and family out into the fresh air. *** Note: if using this map for navigation on your phone or GPS device, you will need to open it within Google Maps to get your current position showing on the map. To do this, simply click the expand icon in the top right corner of this map. This will now provide you live GPS tracking as you walk the map so you always know exactly where you are! WOW! The Google Map and Elevation Chart used in this Post have been produced using the Tom Tom Multi-Sport Cardio GPS Watch. This watch tracks running, cycling, swimming and freestyle, and includes built in heart-rate monitor – and I love it! Check out the Tom Tom Cardio Watch or check out a wider range of GPS watches and Fitness Trackers. Enjoy – they add another dimension to exercise. A very comprehensive overall picture of the Albany Trig track. Look forward to the next track that will be shown. Thanks Dave. Pretty happy with it and hope it will be useful and utilised. Still got a lot to get done but it’s a start. Hopefully I’ll have the next track up this week – The Rata Track off Helen Ryburn. I welcome any ideas also. A great web page, especially for families looking for an outing over the weekend. I loved the run through the bush as it does give a very good indication of what you can expect – not to mention a visual ‘commentary’on the condition of the track. A innovative intro into bush walks around Auckland. Thanks for the comment and glad the comments stuff worked. I had a bit of playing around to do in site settings etc but getting the website up to scratch. I think it will be really great when I have around 50+ walks logged on the site – probably take me a year but once there it can just continue to develop and be a resource. This looks like an amazing walk, and makes me want to do it this weekend! Problem is I live in Australia. New Zealand really has some stunning places that is the envy of the world. I have been to New Zealand a couple of times, but only either to ski, or I only stayed within the city areas for work reasons. This post makes me want to do a whole lot there in the future and one of the things I love about New Zealand is you don’t have half the deadly spiders, bugs and snakes that us Australians have therefore making bush walking more attractive! Thanks Liz for taking the time to read the post and comment – appreciated. Yes – we are indeed very lucky to have the beauty here in NZ and no dangerous creatures that can bother you. I have done quite a bit of walking in Australia, especially Queensland and you are always on edge about the poisonous stuff! Hopefully on your next visit you may be able to take in some of these stunning tracks. We’re heading off skiing at Ruapehu in July – so looking forward to that! Congratulations! 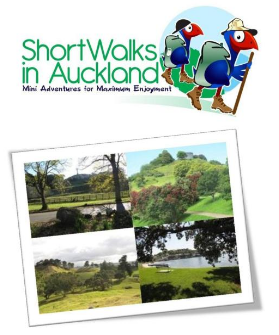 At greataucklandwalks we found every information we need in order to choose the appropriate walk for us or for the Family. 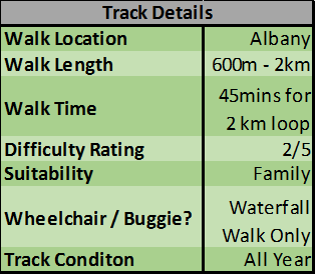 We have the difficulty rate, the length, suitability, maps, personal advice on the best way to enjoy the track,etc. I’ve never been to NZ but i certainly would appreciate that Albany-trig-track with the Kids. Thanks for taking the time to review the Albany Trig Track Post and comment on the site. Appreciated. Yes I am sure the kids would love it – maybe you can bring them to NZ one day :). I love getting out in nature and doing some bush walking. I’ve been to New Zealand a couple of times and would love to go back and explore the nature more. I haven’t spent much time in the Auckland area and didn’t realise there were such places like this not too far from the city. Would definitely love to go their, take my camera and check it out. Thanks for your comment. We are definitely blessed with so many beautiful places in our city to explore. Very lucky. Hopefully you will have the chance to experience them again sometime. This does look like a really nice walk through the bush here and I would certainly keep it mind to do, the next time I go to Auckland. I went there from Australia, over three years ago and found that Auckland does have some very nice parks and gardens, but this walking track does look a great track to take in the views you mentioned. It certainly would be nice to take in the highlights of this walk but it’ll have to wait till my next visit to Auckland. Thanks for taking the time to visit the site and read about the walk. It is indeed beautiful as are so many in this area. Hopefully you get to enjoy it someday. Thanks for posting details for this great wallk so close to where we were staying. My wife and I are over from Perth visiting family and I wanted to get in a short walk before heading back. I parked off Perekia Street near a construction site to get onto the track. My wife and I walked across the new foot bridge to the waterfall, was easy access for her with limited mobility. Although the track was slippery after heavy rain I continued on up to the trig station. The track is undergoing significant work resurfacing with crushed rock. Also new walkways, bridges and steps have been installed. Part of the track has been closed during this work but alternative side tracks can be accessed. Well worth the time thanks. Hi David and thanks for the comment. I appreciate the feedback and glad you enjoyed the track. It is the most popular in the area and a thoroughly enjoyable walk. is the track still open or closed due to Kauri dieback. What other bush tracks around Auckland of 1-3 hours are still open?